Could it be? After multiple false starts, actor hirings and firings, and script revisions, maverick filmmaker Terry Gilliam may finally be ready to conquer the demon that has plagued him for most of his career. That's right, the director behind such triumphs as Brazil and Twelve Monkeys says he's finally preparing to film The Man Who Killed Don Quixote. For real this time. During a recent interview with Empire Online, Gilliam said that Don Quixote will be his next project after the release of The Zero Theorem, which is scheduled to begin a theatrical run in the UK on March 14th. Filming on Don Quixote will take place on the Canary Islands, and will begin in late September. Gilliam's first serious attempt to make Don Quixote began way back in 1998. He teamed up with frequent collaborator Tony Grisoni and created a script that made major changes to the legendary Miguel de Cervantes book from which Gilliam's film draws its inspiration. Wary of his constant creative battles with Hollywood, Gilliam managed to procure a $32 million budget independently. Jean Rochefort and Johnny Depp were cast in the two lead roles, and principal photography began in 2000. The production process was an epic disaster, one ridiculously plagued by misfortune at every turn. Unpredictable weather, financing issues, and health problems involving Rochefort led production to be suspended after only a few days. 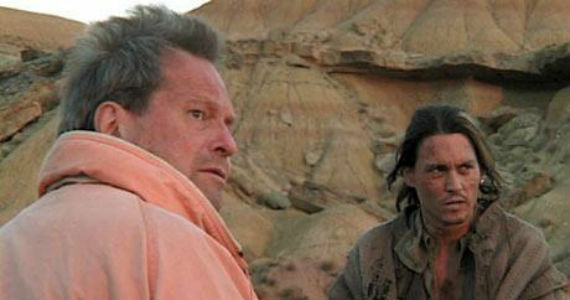 The entire aborted production was chronicled in the terrific documentary film Lost in La Mancha, which even offered viewers a tantalizing glimpse at already shot scenes involving Depp. Gilliam has tried to relaunch the film several times since, but has never gotten past the pre-production stage. "It’s obsessive… desperate… pathetic… foolish. It's this growth, this tumor that's become part of my system that has to get out if I’m to survive." Gilliam is now working with Spanish producer Adrian Guerra and is hopeful that his new partner will be able to finally help him realize his dream. "He’s really smart, loves movies. He’s young enough to still love movies. But we’ve still got to cast it and get the money but other than that, that’s the deal." Gilliam clearly doesn't want his directorial career to end before making The Man Who Killed Don Quixote a reality. The man is now 73 years old and likely realizes that if this film is going to happen, it needs to happen soon. He's not getting any younger, and getting financing only gets harder the longer he goes without a hit film. Fortunately, Adrian Guerra has already produced ten films in his short career, and it would appear that he has the skills to finally get Quixote off the ground. That said, Gilliam's quest to make this film occasionally borders on the definition of insanity - which is to say, he constantly attempts to make the same seemingly doomed film expecting different results. Sure, The Man Who Killed Don Quixote could very well end up being the magnum opus of Terry Gilliam's career, but can he ever truly hope to make a film that lives up to his astronomical expectations? For his sake, let's all hope the answer is yes. The Man Who Killed Don Quixote is scheduled to begin production in September 2014.